Author: Robert D. Anderson, J.D. This guide to the Florida laws governing your clinical laboratory practice is updated when the Board of Clinical Laboratory Personnel changes its regulations or the State Legislature changes the laws. Being aware of these laws can help ensure your compliance with regulatory requirements and help you and your subordinates avoid problems with governmental agencies, accreditation bodies, and malpractice liability. 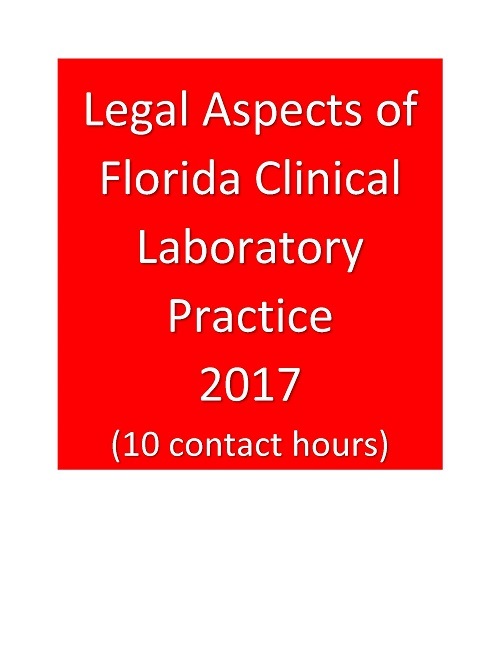 In Legal Aspects of Florida Clinical Laboratory Practice, you’ll read about the laws that govern: Scope of practice of clinical laboratory personnel • Continuing education • Disciplinary actions against clinical laboratory personnel • How certain tests must be performed and reported • Clinical laboratory licensing requirements • Criminal offenses related to clinical laboratory practice • Medicare fraud • Consents • Medical records • Malpractice • Patient rights. The course includes examples of many disciplinary actions taken against the licenses of clinical laboratory personnel.